This is a seriously regional favorite. So seriously regional that much of Texas won’t even know what these are. Only the folks from San Antonio will smile knowingly and nod their head, saying, “Yes. Puffy tacos. We go way back.” San Antonians love their puffy tacos. So much so that the local minor league baseball team The Missions has a secondary mascot: a puffy taco. PK tip: A bizzare seventh inning stretch tradition involves a small child that circles the bases in furious pursuit of the taco. They almost always manage to tackle the taco just before the it reaches home. Good times. I keep telling you to visit. Some say they were originally created at Henry’s in San Antonio. It’s different from a regular taco in the sense that the raw masa tortilla is simply fried, not griddled then fried as in most gordita, taco and chalupa shells. The resulting shell is, well, puffy. And delicious. And like no other taco you can buy anywhere outside San Antonio. You know you’re curious. Go on, fire up that fryer. 1/2 c homemade chicken, beef or vegetable stock, otherwise use water. Really. Combine all in a small pot and cook over very low heat until the flavors combine and the onions are very soft. About 20 minutes. Mix masa and water until dough forms, knead a few times to form a good ball. Divide the dough into 16 pieces and roll into small balls. Using a tortilla press (or a small skillet with a very flat bottom) press the balls into tortillas about 5 inches wide. PK tip 2: Keep them on a pan covered with a damp dishcloth. They dry out fast and you will want to kill Santa Claus for how easy they’ll crumble if you don’t keep them moist. Heat vegetable oil to 350 degrees. This is important. You don’t want greasy tacos. When oil is hot slide in a tortilla, and flip after about 15 seconds. Press down in the center with tongs or a spatula to create the taco shape. Cook another minute to minute and a half turning to cook both sides evenly. Move to a rack over a baking sheet in the oven over low heat to keep warm while you fry the rest. 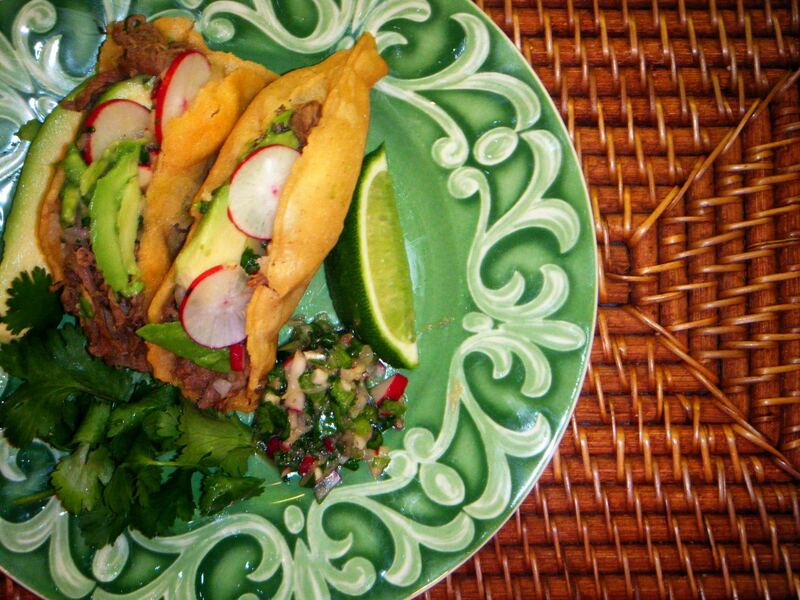 Serve with thin slices of radish, ripe slices of avocado, leaves of cilantro and a simple red radish salsa. For that combine: 6 small radishes finely diced; 2 cloves of garlic, very finely diced; 2 green onions, sliced; 1/2 jalapeno, very finely diced; small handful of coriander (cilantro), chopped; good squeeze of lime juice; good splash of balsamic vinegar and olive oil; pinch of brown sugar; salt and pepper to taste. Playlist included Fiesta, by The Pogues. 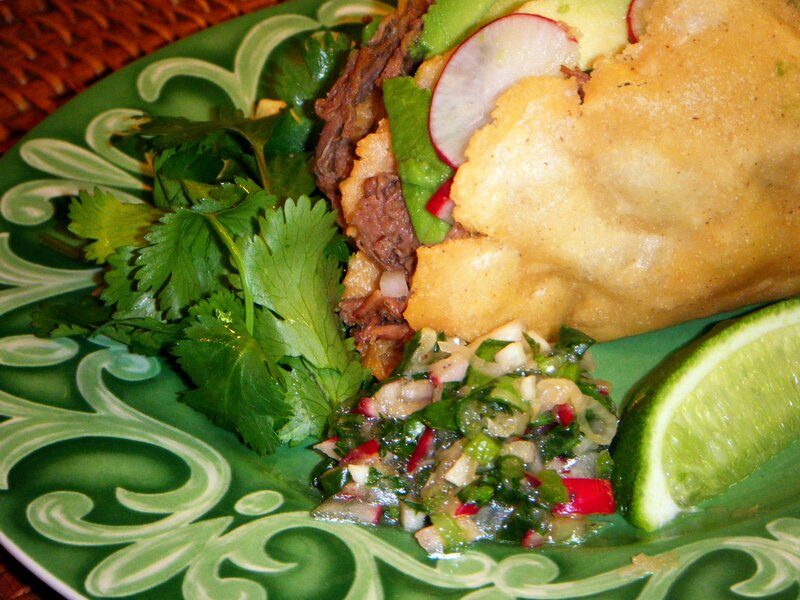 A puffy taco…brilliant! why didn’t i think of this. what a wonderful way to freshen up the taco. ill be making mine with braised beef as well. thanks for sharing.